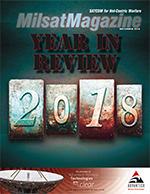 According to NSR’s Government & Military Satellite Communications, 15th edition report, the outlook for Government and Military SATCOM Markets will exceed $71 billion in retail revenues over the next ten years. Taken as a whole, space-related actions in 2018 have signified the promise of a sea change in the way the U.S. government acquires critical satellite communication capabilities. Confronted with asymmetric warfare since the end of the cold war, NATO Allies have maintained an edge over potential enemies thanks to their advanced Command and Control (C2) systems. Moreover, dominance in the air and in space has allowed almost unimpeded Intelligence Surveillance and Reconnaissance (ISR) coverage of threat areas. Why should we care about space threats? Isn’t space peaceful? Unfortunately, no. Mr. Richard White is President of SSL Government Systems, where is he is responsible for leveraging SSL and Maxar Technologies capabilities to serve the U.S. Government. He has served in senior management roles across multiple companies and mission areas, including intelligence, surveillance and reconnaissance, satellite antennas and payloads, and cyber security.